What seems like long ago now, I was an elementary teacher. I enjoyed my job, but loathed the bureaucracy. So, ten years ago when I gave birth to my first child, Bean, I started my journey as a stay-at-home-mom. Only 4 months after she was born, she was diagnosed with an egg and milk allergy and so began our food-allergy journey. Next came the peanut allergy, and now there are too many to list. Bean is a caring, intelligent little girl. Her love and affection knows no bounds. She is spunky and quick-witted, silly and solemn. She has probably one of the most inquiring minds I’ve ever encountered and is constantly absorbing more and more knowledge. She is already a wise old owl, at the tender age of 10. Our second daughter, Bella, was born in 2010 and our little family became complete. We are grateful that little sister doesn’t have any allergies. She has a sunny disposition and looks up to her big sister, who treats her as her own best friend. Bella loves to take risks and certainly keeps us on our toes. But she, too, is a miniature intellect, often surprising us with her memory and wit. We tried sending Bean off to preschool at age 4, but it just wasn’t a good fit for us. She wasn’t learning much more than bad behavior, had terrible allergies and eczema and even developed asthma at the indoor/outdoor school. It was a 30 minute drive and pick up was always during her baby sister’s nap. It was brutal. I decided to homeschool her for the remainder of preschool. Yep, it is not easy to learn to teach your own child when you are used to a classroom of children in a school environment! So I gave up. I figured, who needs preschool anyway, right? The following year, I decided to enroll her in a “hybrid” school. A hybrid school is one that merges public school with homeschool. There are a few different ways that hybrid schools can work, but the one we used supplied the curriculum for free to be taught at home. They assigned Bean to a classroom teacher to meet with once a month to once a week. Bean had classroom time once a week at first but quickly advanced to only being required to attend twice per month. This school was a great stepping stone into homeschooling. Despite the rigorous, tedious, repetitive curriculum they supplied, I was able to see the potential in homeschooling. Soooooo…. 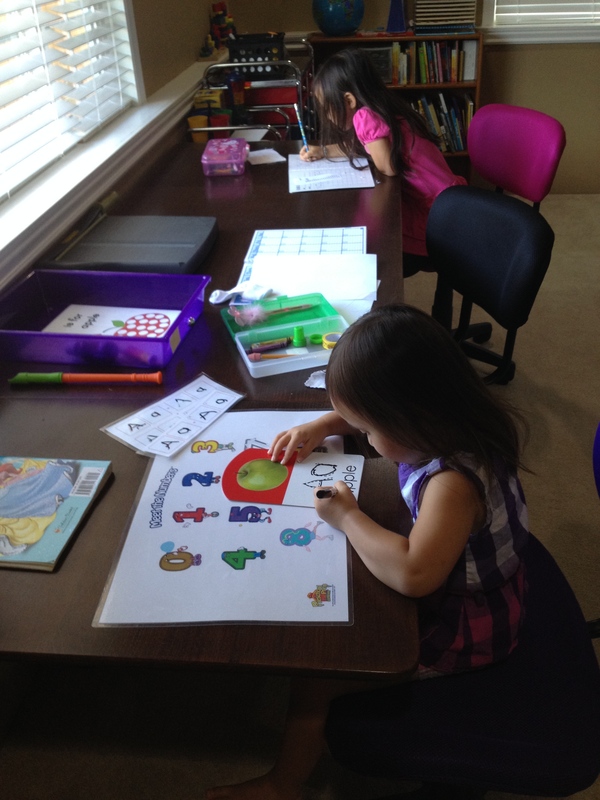 Both girls work well alongside me in our little classroom area. Bella has requested that I teach her to read, and give her school activities every day. So I have set up work boxes for her and am letting her learn at her own pace. I don’t want her eagerness to fade away! I never imagined myself homeschooling my children. I always assumed I’d be a teacher at their elementary school, just not the one teaching them. I imagined us riding to school early, them hanging out in my classroom after school, doing their homework while I graded papers… It was a perfect picture in my head. But after walking down this long, winding, uncertain path, here I am, doing something I have slowly fallen in love with. We have arrived, yet our journey has just begun. We are bringing school home. Occasionally, I may use affiliate links within my blog posts. This means that the clicks you make may support our homeschool, at no cost to you. That said, be assured, every opinion expressed here on Bringing School Home is my own. I blog solely to document and share our journey in the hopes that it could help other families like ours.